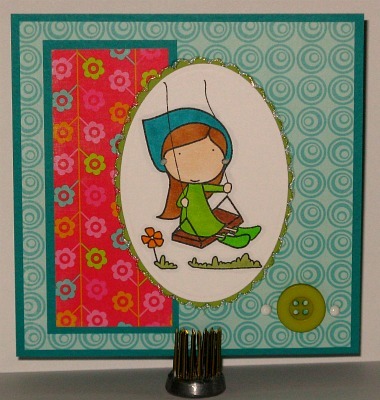 I used an Abigail C stamp called Spring Swing. She’s so cute! I colored her up with my copics and added some liquid pearls to her earrings. I used some sparkly stickles to the scalloped nestabilitie border for bling. The button and brads in the corners are also from the kit. I’m having tons of fun with this card kit. Are you? I’d love to see what you are making with this kit. If you’ve added a card to your blog using this kit, why not leave a comment so I can pop over and have a look? I’d love to see your work. Enjoy your day….and I hope it’s a beautiful sunny one where ever you are. Card kits are the best!! Super cute card Janet!! Not sunny here, but it's not raining so I'm good with that!